I need to start off by stating that for most of my life, fish were the only pets around. Cats were out of the question as my father is quite allergic as am I and my youngest sister. Although, we did have a few stray cats that took up residence in our outdoor space. Then, during my senior year in high school we got a new stray that found it’s way to our house… a small black puppy who’s whimpers and cries could not be ignored. Dad fed him Pac-Man cereal (it WAS the 1980’s) and from that moment on he was part of the family. Trying to have him sleep in a lined box in the garage didn’t last long. Then, it was confined in the laundry room at nights for a few days. Finally, though, he ended up becoming a constant companion for my dad until his health problems got the better of him many years later. As a married couple, Mr. O and I have had 2 dogs and a short lived attempt at a bird. Our first dog, Sam, was with us for just a few months before he needed to be put down. I was hesitant to get another dog for while. But, less than two months later we met and fell in love with an Irish Setter that we named Amber. She was loving and the perfect dog for a young family. Before we were ready to say good-bye to her, we found ourselves faced with the need to put her down at the age of 11 as she’d developed leukemia. Having a wonderful pet who’s health so suddenly deteriorates and then is gone was difficult to go through and the boys didn’t quite understand why Mom was crying so much that day. We’ve yet to get another pet, although Mr. O and the boys desperately want a dog now. All that being said, I went into this review with no true expectations of what to find. Sasha, Extraordinary Dachshund is a love story from her owner, CJ Adams, shared with those willing to read. CJ’s husband also weighs in at times. The reader gets some backstory to the couple’s history with pets, especially CJ’s intense love of animals starting at a young age. You learn how Sasha chose them and quickly became a valued member of the family. And, you are treated to short stories of Sasha’s interaction with friends and family over the years. Intertwined with these stories is another type of tale. At the age of 4, Sasha suffered a bout of paralysis which catapulted them into the world of holistic veterinary medicine and acupuncture in the hopes of saving her life. This path runs throughout at least half of the book, including the addition of another dog who also gets similar treatments. While the story was okay and most definitely reflects the love felt by the author for this particular dog, it is not a story that would appeal to a broad audience like some animal centered tales I’ve read. However, for a pet lover who is also curious to hear about how another animal was treated in ways that complemented traditional veterinary medicine, this could be a good read. Sasha, Extraordinary Dachshund retails for $14.95 US or $16.25 CAN. I noticed that Amazon has it in print format and for the Kindle. Disclaimer ~ I was sent a copy of the book for the expressed purpose of writing a review. No monetary compensation occurred and all opinions are my own. If you’d like to see what other reviewers thought of this title, visit the Media Guests Tour Page for CJ Adams. I had a Dachshund for 13 years, she was black & brown, we lost her in November to congestive heart failure, I miss her so much, maybe in time I will get another one, she was a good dog, & my baby. Laura, Thank you for taking the time to review "Sasha, Extraordinary Dachshund." I appreciate your view of my memoir and especially the comment, "...is a love story from her owner, CJ Adams, shared with those willing to read." 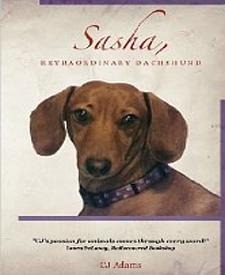 I did not write "Sasha, Extraordinary Dachshund" to appeal to a broad audience. I wrote it in hope that our story could positively affect or influence other animal owners with the holistic veterinary medicine information I detail in the memoir. I am pleased to say that as of today I am aware of 4 people/pets (1 in England, 1 in Australia, 2 in US) who are seeking out alternative treatment, specifically acupuncture, for their "downed" dachshunds due to my memoir. I am even happier to report that all 4 are experiencing successful results. "Sasha, Extraordinary Dachshund" is making a dramatic difference in the welfare of a few and that knowledge gives me hope that it may help even more. Avid readers/reviewers like you help to get that information in front of people I may never be able to reach and I am so very grateful for you and your comments.